British Village Favourites on a Quilt! Welcome to our brand new Block of the month called Vintage Village. 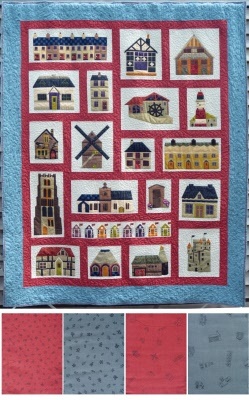 Designed by Sue Rhodes and Sue Trangmar, this delightful quilt features buildings from all over the Great Britain. This is an appliqué project and we have teamed up with Dashwood Studios to produce our exclusively designed sashing and border fabric, which features detailed miniature line drawings of the buildings. The exclusively designed sashing and border fabric was produced as a strictly limited run, so places on the programme are limited. These fantastic new designs are featured above. Click on the image to see a larger version. You are able to personalise and choose the colourway of your quilt, as we have had both of the fabrics printed in both colourways. So you can have the same as us, or you can choose a red border with blue sashing or all red or all blue fabrics! The finished quilt measures 92 x 69 1/2 inches and will run for 12 months. You will receive fabrics for two blocks every month and in month 11 you will receive the sashing fabric of your choice and month 12 the border fabric of your choice. Alternatively, you can ring us on 01323 848894 to join. I understand that my credit/ debit card will be debited once a month for £20.00 per month plus postage for a period of 12 months. I agree that by signing up for the Vintage Village Block of the Month that this forms a contract for the full twelve month term of the programme. Should I cancel during the programme then I am liable to be charged for the remainder of the quilt project.